A Free OSR Character Sheet! Why should 5E players have all the fun with Form-fillable PDF character sheets? 1E / OSRIC players, have no fear, Fail Squad Games is here! For those folks who love digital things at the table and DMs who want NPCs in their digital files, this FREE character sheet is a big help. Created from the Standard Fail Squad Games character sheet, just open the PDF, fill in the blanks and print or save. 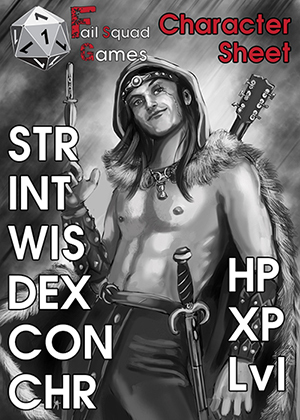 Click the image or CLICK HERE to download the FSG Form Fillable character sheet. For now the image is hosted locally right here at FailSquadGames. If traffic gets too heavy on the link, it may get hosted elsewhere. Thank you for using the FSG character sheet, and we hope you will support Fail Squad Games by sharing links, articles, and cruising our online store. ← It’s time for a NEW adventure!